a DynamoDB instance: Hackolade accesses DynamoDB either local or hosted at AWS. It performs a sampling of the selected tables, and probalistically infers the Hackolade schema from the sampled data. a Couchbase instance: Hackolade accesses a Couchbase instance through a connection, samples the selected bucket(s), and probalistically infers the Hackolade schema from the sampled data. 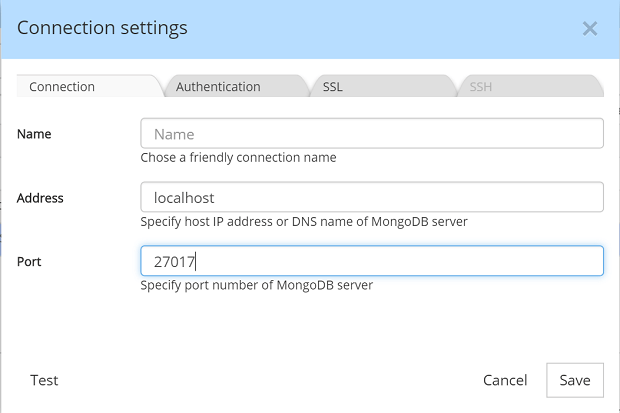 a Cosmos DB instance: Hackolade can reverse-engineer a local instance of Cosmos DB or hosted at Azure, using either the SQL API (previously known as DocumentDB API) or the MongoDB API. The process performs a sampling of the selected collections and document types, and probalistically infers the Hackolade schema from the sampled data. an Elasticsearch instance: Hackolade accesses an Elasticsearch instance through the REST API, samples the selected indices and types, and probalistically infers the Hackolade schema from the sampled data plus the retrieved mappings. an HBase instance: Hackolade accesses an HBase instance through the REST API, reads the table and column family setup, then samples column qualifiers with JSON types to probabilistically infer the Hackolade schema from the sampled JSON data. a Neo4j graph instance: Hackolade accesses a Neo4j instance through the REST API, and reads the Cypher setup for node labels and relationship types. a Cassandra or DataStax (DSE) instance: Hackolade accesses a Cassandra instance through the REST API, reads the table and column setup, then samples columns with JSON types to probabilistically infer the Hackolade schema from the sampled JSON data. an Apache Hive instance: Hackolade accesses Hive via the Thrift service, reads the table and column setup, then samples columns with JSON types to probabilistically infer the Hackolade schema from the sampled JSON data. an Apache Avro data file or schema.Hackolade reads .avro and .avsc files from the file system to convert the Avro schema in a Hackolade model. This feature is also available via the Command-Line Interface. This process includes a series of steps outlined below. After going through the steps, the user is free to enrich the model for documentation purposes, and to generate forward-engineering scripts. For more information on the various authentication and encryption protocols, please consult these pages. In MongoDB 3.2, collections are sampled with the $sample operator via the /core/aggregation-pipeline. This provides efficient random sampling without replacement over the entire collection, or over the subset of documents specified by a query. - Hackolade opens a cursor on the desired collection, limited to at most 5000 documents sorted in descending order of the _id field. - sampleSize documents are randomly selected from the stream, using reservoir sampling. 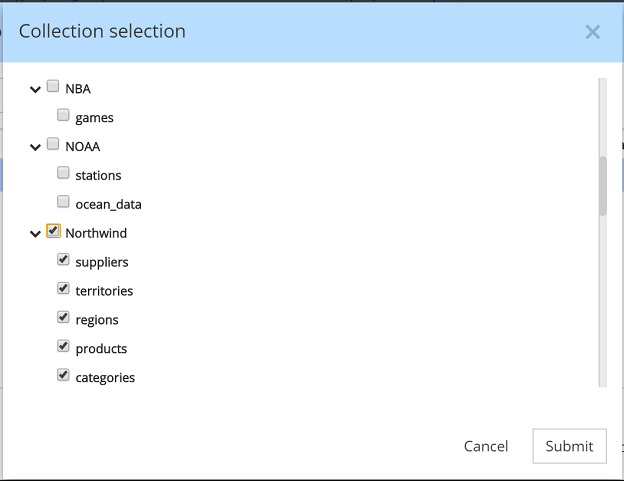 - Hackolade performs a query to select the chosen documents directly via _id. Currently, sampleSize is set to 1000, 2500 or 5000 documents, via a user parameters in Tools > Options. Note that this sampling mechanism is originally provided in Open Source by MongoDB, adapted to the specific needs of Hackolade. Note that this inference mechanism is originally provided in Open Source by MongoDB, adapted to the specific needs of Hackolade. 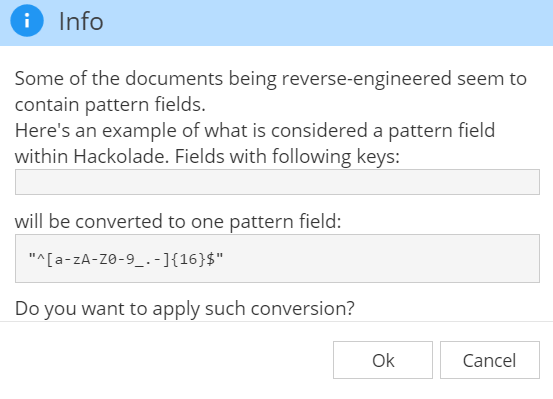 As of v2.5.0 of Hackolade, we've also introduced the ability to detect pattern fields during the reverse-engineering process. For any sub-object at a given level, we can infer the presence of a pattern field if we detect the recurrence of similar regex patterns in field names. In this final step, the derived schema needs to be converted and persisted into the Hackolade notation, so it can be visualized, adapted and enriched in the application. The process for DynamoDB is similar to the one for MongoDB. Except that the connection protocol and the data query are of course adapted to the technology. The process for Couchbase is similar to the one for MongoDB. Except that the connection protocol and the data query are of course adapted to the technology. The process for Cosmos DB is similar to the one for MongoDB. Except that the connection protocol and the data query are of course adapted to the technology.